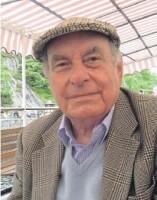 A journalist who followed his father and uncle into the industry before going on to enjoy a career spanning five decades has died aged 83. George MacDonald, who worked for both the Press & Journal and The Herald, died at his home last week following a battle with lung cancer. The newspaper industry was literally in George’s blood as his father, also called George, had been chief reporter at The Herald’s Aberdeen office while his uncle, Norman, was the P&J’s sports editor. An obituary appeared in his old paper the P&J on Saturday, written by reporter Ben Hendry. George, pictured above, first joined the paper in 1964, reporting on that year’s Typhoid epidemic and the collapse of Aberdeen University’s zoology building – which killed five people in 1966. Later that year he succeeded his father at The Herald, a position he held until his retirement. Former colleague and friend Keith Webster remembered George as a “hugley respected” journalists who documented many of the region’s most momentous events. He said: “During his tenure, the North Sea oil and gas industry evolved and George became a leading writer on the subject. “He was so respected and trusted that he had no trouble speaking to the highest levels of management, they would seek him out to talk to him as well. George, who never married or had children, is survived by his older sister, Elsa. His funeral will take place at Baldarroch Crematorium, at Crathes, at 1pm on Friday.